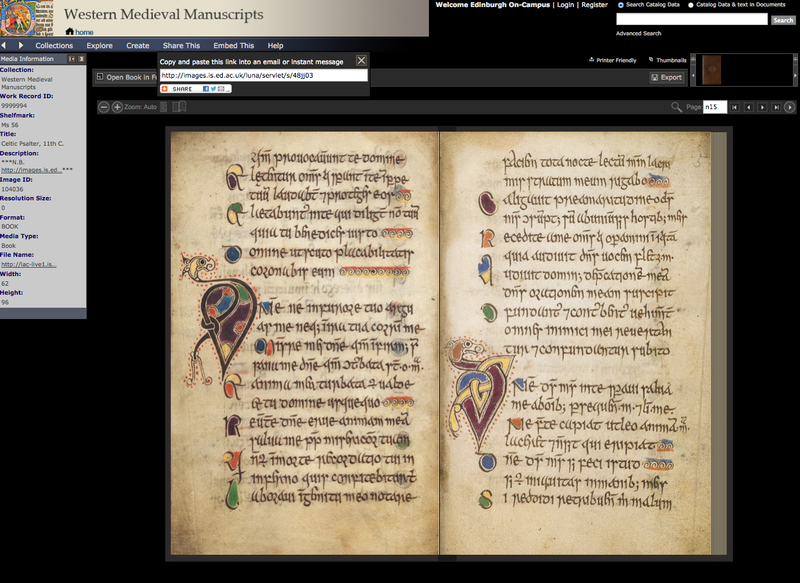 One of the real treasures of Special Collections is the 11th century Celtic Psalter (Ms 56)- at nearly 1000 years old, it is referred to as the oldest book in Scotland. This beautifully-decorated manuscript is now available virtually, using the LUNA page turning software, so please take this opportunity to view it for yourself here. Please note, the images for book reader objects are reduced in resolution for ease of use, so if you wish to see the individual pages at full resolution, you can find them here. The Digital Development team only did the last piece of work- getting it online. The hard work of measuring and cropping the existing TIFFs and getting them to snugly fit the needs of the software was all done by the Digital Imaging Unit.